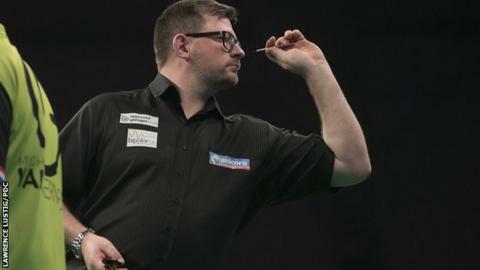 James Wade inflicted Michael van Gerwen's first defeat of the 2019 Premier League in Exeter. World number one Van Gerwen had a 100% record after three games but lost 7-3 to Wade, who won five straight legs after trailing 3-2. Former world champion Rob Cross, thrashed by the Dutchman in his previous match, returned to form by beating Daryl Gurney 7-1. Elsewhere, Mensur Suljovic and Michael Smith got their first victories. Austria's Suljovic overcame Peter Wright, while Raymond van Barneveld was beaten 7-4 by World Championship runner-up Smith - who limped his way through his match three days after having surgery to remove an abscess from his groin. The other game from the fourth round of fixtures ended all-square, with in-form Welshman Gerwyn Price missing double 12 for a nine-dart finish in his 6-6 draw with Luke Humphries. World Championship quarter-finalist Humphries, the latest "contender" to fill in for the injured Gary Anderson, impressed on his Premier League debut and twice narrowly missed big checkouts to seal victory. All 10 players will be involved in the UK Open, which starts in Minehead on Friday. Anderson, who withdrew from the Premier League because of a back injury, is the defending champion.